Over the last few days I have been using my watching-tv-hands-needing-something-to-do-time to make some artists’ trading cards. These are for a swap being organised by Vicky at Lucy Blossom Crafts. 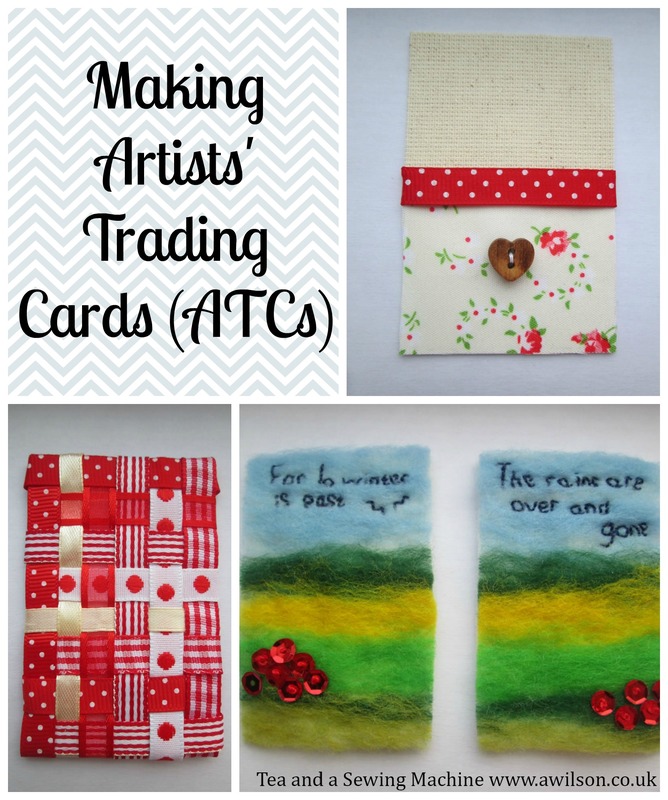 As I have never made ATCs before, and being anxious to get it right, I checked the internet to find out exactly what I was supposed to do. It would seem that pretty much anything goes! The only rules are that they must be about the size of a business card and they are always swapped, never sold. Lots of talented people out there are doing amazing drawings on theirs. I am not good at drawing. However, as it seems that I can do whatever I like here, I have decided to use textiles as this is something I can do! These are the ones I’ve made so far. 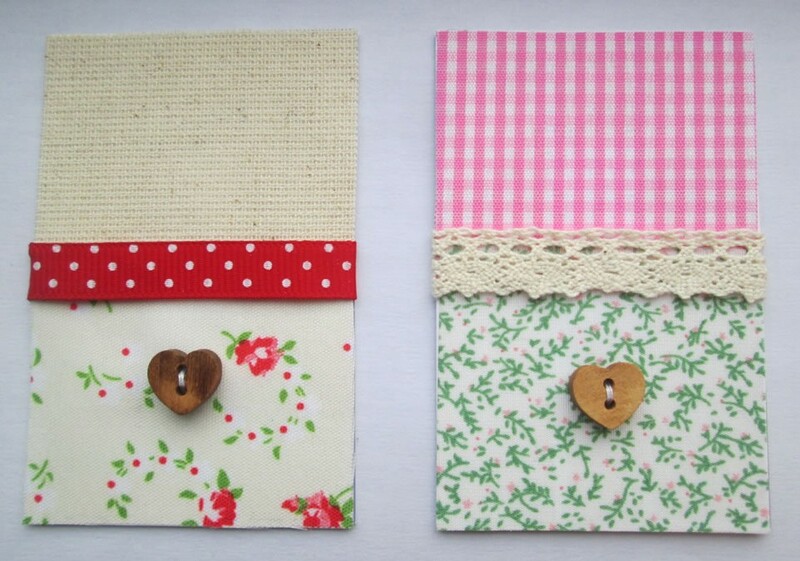 For these two, I covered each half of the card in different fabric and I hid the join with a piece of ribbon. On the bottom half I sewed a button in the middle. I did this before sticking the fabric down! To stick the fabric to the card, I used double sided tape. As I was concerned that the ends of the ribbon would look messy, I stuck those underneath. The business cards I used were purple and the fabric was quite thin and the purple showed through. So I stuck the fabric to the white side, then using double sided tape I stuck two cards together. This had the additional benefit of sandwiching the messy ends of the ribbon. 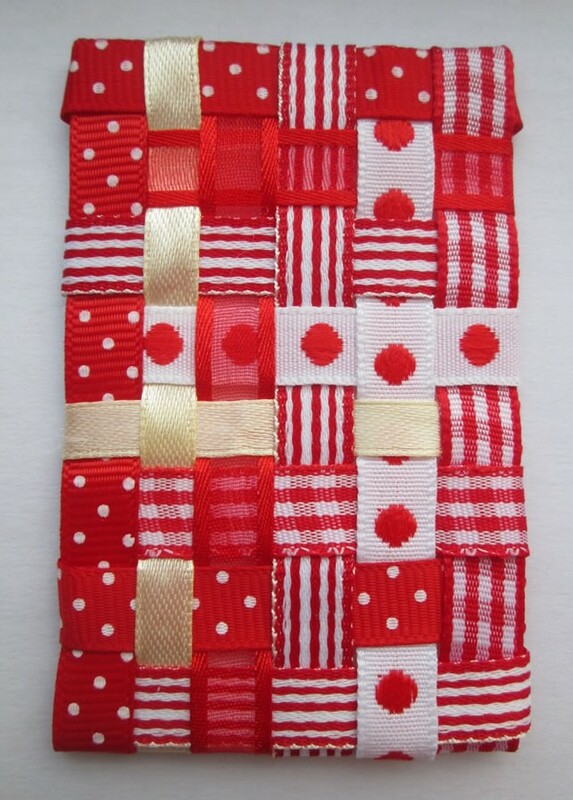 For this one I wove ribbon together. It was a lot fiddlier than I was expecting it to be! Using double sided tape I taped the vertical ribbons down at the back, then I stuck each horizontal ribbon at the back as I worked with it. The ribbons kept coming unstuck! It was a relief when I had finished it and I could permanently stick down the ribbon ends by sticking another card to the back. I decided to make some felted ones too. Usually felt shrinks a lot during the process of it being made, but I bought some more roving recently and it doesn’t seem to shrink as much. Perhaps it is the breed of sheep. 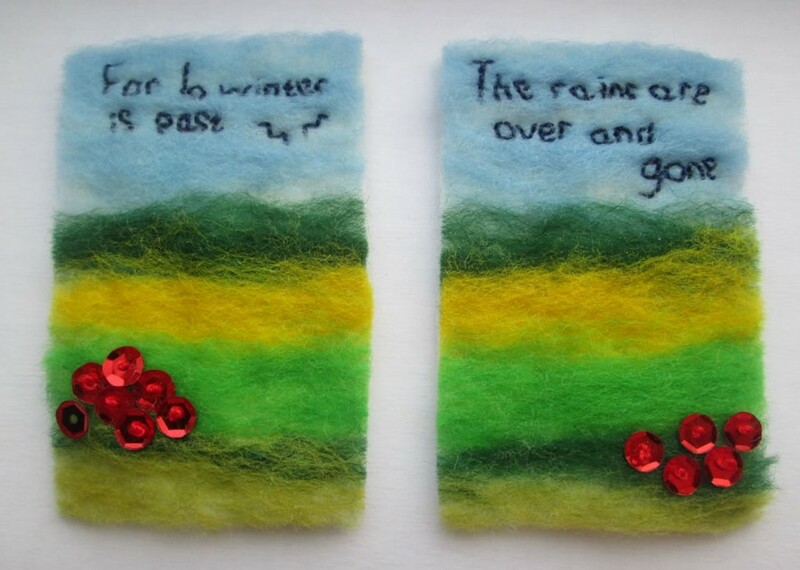 Anyway, the pieces of finished felt were larger than I was expecting, so I was able to make two atcs from each piece. I just thought it was nice for spring time. 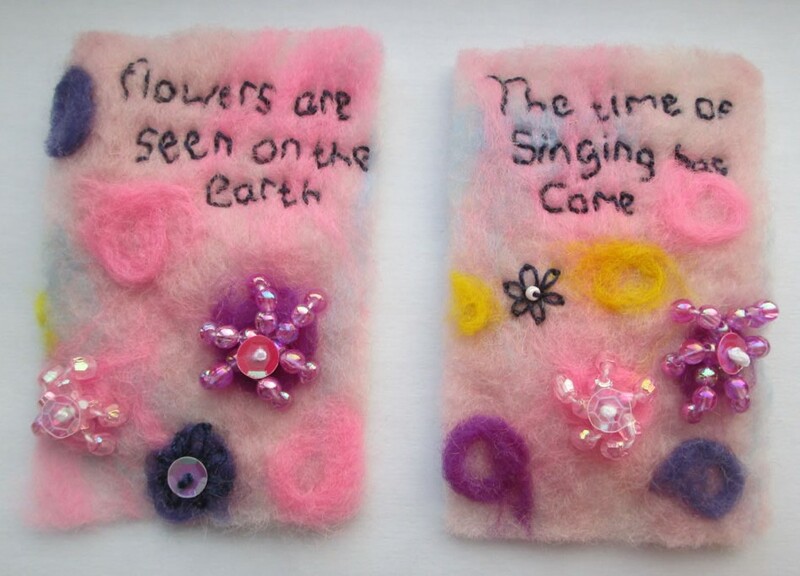 For the flowery felted atcs, I added shades of pink and blue to the background of the felt. To make the circles, I twisted some of the roving around a finger before adding it to the top layer. I used sequins, beads and embroidery to make the flowers. I was planning to put one verse on the landscapes and one verse on the flowery ones, but there wasn’t enough room! The writing was as small as I could embroider it while keeping the letters readable, so I added half a verse to each instead. As to what to write on the back, the consensus in internetland seems to be that you put your name, email address, website, and whether it is OOAK, one of a series, or one if a limited number. I’m looking forward to seeing what other people have made!